Brighton extended their lead at the top of the Championship to five points with victory over bottom side Rotherham. 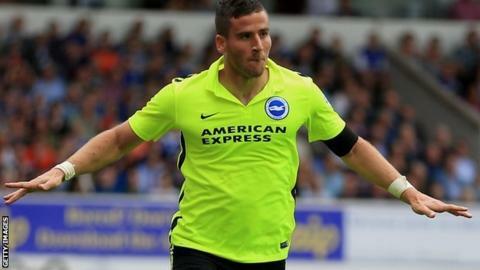 Israel international Tomer Hemed scored for the third successive Brighton game to give the hosts a 27th-minute lead. The winless visitors improved after the break and Chris Maguire missed a good chance to level. But Dale Stephens made it 2-0 with a crisp finish beyond Lee Camp before Jonson Clarke-Harris pulled one back with a header from a free-kick. Brighton, who have scored first in each of their games this term, started brightly and Sam Baldock's volley flew over the bar before Jamie Murphy dragged a shot wide. But Hemed gave the hosts a deserved lead with a neat finish from Murphy's low cross. The Millers were given a great chance to equalise just after the restart but Maguire was unable to capitalise on some poor defending from the Seagulls. The visitors could not make the most of their strong start to the second half and found themselves 2-0 down in the 67th minute when Stephens finished well after the ball broke into his path. Substitute Clarke-Harris gave the Millers a glimmer of hope when he headed home Joe Newell's free-kick. Bruno nearly made it 3-1 to Chris Hughton's side but Camp produced a fine save from his dipping volley as the hosts saw the game out. Brighton manager Chris Hughton: "We could, and perhaps should, be winning games more convincingly. That is my only disappointment. "At 2-0 up, we need to be managing the game better and need to be more clinical. "We are now the only unbeaten side in the Championship and our points tally is brilliant." Rotherham United manager Steve Evans: "What was critical from our point of view was when Matt Derbyshire missed an early header that would have put us in front. "Chris Maguire also put a chance over just after the break so we did create things. I am not disappointed with the effort and commitment." Match ends, Brighton and Hove Albion 2, Rotherham United 1. Second Half ends, Brighton and Hove Albion 2, Rotherham United 1. Chris Maguire (Rotherham United) wins a free kick in the defensive half. David Stockdale (Brighton and Hove Albion) is shown the yellow card. Foul by Greg Halford (Rotherham United). Gordon Greer (Brighton and Hove Albion) wins a free kick in the defensive half. Attempt saved. Beram Kayal (Brighton and Hove Albion) left footed shot from outside the box is saved in the centre of the goal. Assisted by Bruno. Substitution, Brighton and Hove Albion. Liam Rosenior replaces Solly March. Foul by Vadis Odjidja-Ofoe (Rotherham United). Attempt missed. Solly March (Brighton and Hove Albion) left footed shot from the right side of the box misses to the left. Assisted by Bobby Zamora. Foul by Rohan Ince (Brighton and Hove Albion). Vadis Odjidja-Ofoe (Rotherham United) wins a free kick in the defensive half. Attempt saved. Solly March (Brighton and Hove Albion) left footed shot from the right side of the box is saved in the centre of the goal. Assisted by Jamie Murphy. Attempt saved. Bobby Zamora (Brighton and Hove Albion) right footed shot from the centre of the box is saved in the centre of the goal. Assisted by Beram Kayal. Substitution, Rotherham United. Greg Halford replaces Richard Smallwood. Corner, Brighton and Hove Albion. Conceded by Lee Camp. Attempt saved. Bruno (Brighton and Hove Albion) right footed shot from outside the box is saved in the top centre of the goal. Corner, Brighton and Hove Albion. Conceded by Chris Maguire. Corner, Brighton and Hove Albion. Conceded by Farrend Rawson. Attempt blocked. Tommer Hemed (Brighton and Hove Albion) left footed shot from the left side of the six yard box is blocked. Foul by Chris Maguire (Rotherham United). Bobby Zamora (Brighton and Hove Albion) wins a free kick in the attacking half. Foul by Lewis Buxton (Rotherham United). Goal! Brighton and Hove Albion 2, Rotherham United 1. Jonson Clarke-Harris (Rotherham United) header from the centre of the box to the bottom left corner. Assisted by Joe Newell with a cross following a set piece situation. Vadis Odjidja-Ofoe (Rotherham United) wins a free kick on the right wing. Attempt blocked. Jonson Clarke-Harris (Rotherham United) left footed shot from outside the box is blocked. Assisted by Chris Maguire. Substitution, Brighton and Hove Albion. Bobby Zamora replaces Sam Baldock. Chris Maguire (Rotherham United) wins a free kick in the attacking half. Goal! Brighton and Hove Albion 2, Rotherham United 0. Dale Stephens (Brighton and Hove Albion) right footed shot from outside the box to the bottom left corner.